NORTHERN Ireland’s former network of 26 councils, phased-out in a cost saving shake-up of local government, spent more than £300,000 on farewell parties and events. Detail Data can reveal the switch to an 11 ‘super council’ system on April 1 this year resulted in publicly funded receptions for councillors and staff, exhibitions, commemorative books, a concert and community carnival. The majority of outgoing councils spent less than £15,000 on initiatives, but three spent considerably more, with the highest individual bills lodged by Craigavon (£44,500), Down (£48,858) and Newry & Mourne (£44,460). Information on the costs has emerged after it was revealed that the combined council debt and liabilities across Northern Ireland rose from £367million in 2008 to over £1billion for the 2013/14 financial year. 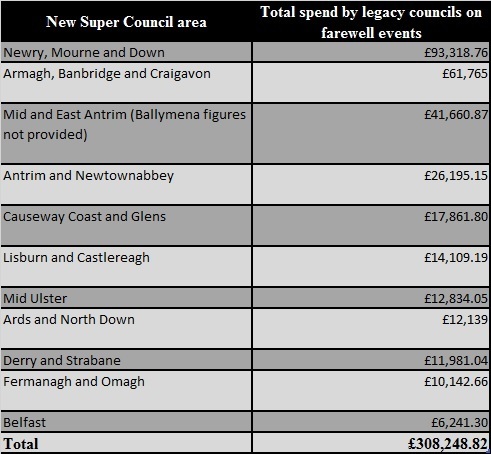 The £308,248 spent on farewell events, plus the scale of council debt, comes against a background of forecasts by the Stormont administration that the new super-council system would save as much as £438million over 25 years. The Department of Environment (DoE), which implemented the local government reforms, responded to the Detail Data findings by claiming the savings could still be made, depending on the decisions of the 11 new councils. “It would be for councils as, autonomous bodies, to answer any questions regarding their expenditure on farewell events,” the DoE said. “The reform of local government is estimated to deliver projected savings at £20million per year over 25 years. The reform of local government was first launched in June 2002, but after a series of delays and set-backs the super-council project was finally implemented in 2015. At one stage a seven council system was proposed, while debates over new electoral boundaries and funding packages to cover the estimated £118million transition cost also threatened delivery. During that time, council debts and liabilities rocketed from £367million in 2008 to over £1billion for the 2013/14 financial year. The DoE confirmed that debt levels for the 2014/15 year, the time period marking the handover from 26 to 11 councils, will be published on October 31. Detail Data lodged Freedom of Information requests with each of the 11 new super-councils seeking a breakdown of the money spent on farewell events by the legacy councils. Figures were returned by 25 of the 26 local authorities. Figures have not yet been provided for Ballymena. Only one of the former councils, Magherafelt, did not incur any expenditure on initiatives or events to mark the life of the council. Of the councils that did, their spending varied from £880 in Moyle to £48,858.76 in the former Down council. Analysis of the data revealed that the majority of events were in-house council affairs, including lunches, dinners and celebration events for councillors and staff. This accounted for more than £85,000 of the total spend. However, the three most expensive initiatives were more public affairs: a community initiative involving 91 groups in Craigavon (£44,500), a concert in Newry (£40,290) and a community carnival in Downpatrick (£36,344.26). 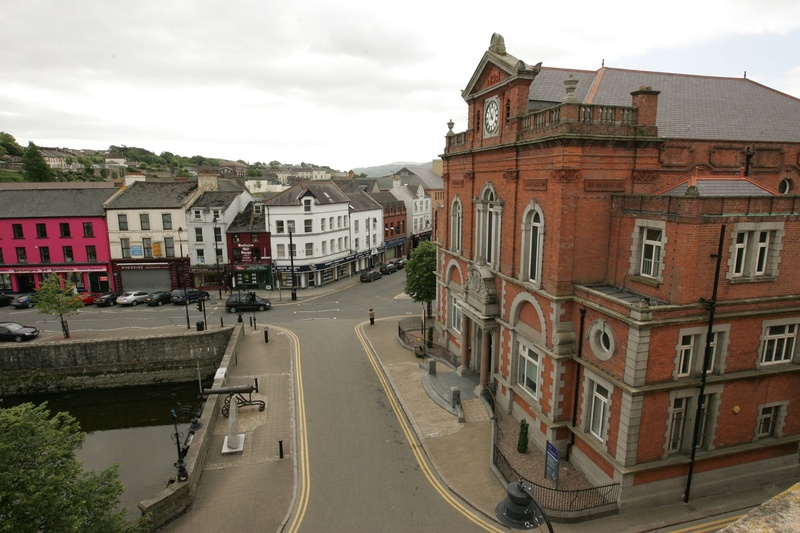 Historical events, such as exhibitions and the publication of commemorative books, also accounted for a sizeable proportion of spending, with more than £15,000 spent in Banbridge on the production and launch of 1,000 copies of a legacy publication. In addition to its community carnival, Down District also spent over £10,000 on a commemorative book, while Antrim’s exhibition and booklet (£3,011), Newtownabbey’s exhibition (£1,654) and Cookstown’s exhibition (£920) cost considerably less. Three councils - Antrim, Coleraine and Lisburn - also raised money for local charities during their legacy function events. The figures for the former Ballymena Council were provided on October 21. The council, now part of the new Mid and East Antrim Council, undertook three farewell initiatives costing £36,120. These included a ‘ratepayers commemorative magazine’ which was issued to all households in the district at a cost of £17,638; a ‘recognition ceremony’ at The Braid centre costing £15,840 and the issuing of a letter from the chief executive and Mayor – along with a Ballymena Borough Council mug to all staff – costing £2,642. This means the expenditure in the new Mid and East Antrim council area totalled £77,780.87. In addition to the debt inherited by the new councils, figures released to Detail Data by the Department of Finance and Personnel in response to a Freedom of Information request, highlight the level of financial strain on businesses and householders in each of the former 26 districts. As of March 31, 2014, rates arrears totalled nearly £163million with nearly 11% of all domestic properties and nearly 18% of non-domestic properties behind on their bills. The former Newry and Mourne area had the highest level of domestic arrears, with 16.4% of domestic properties in an element of arrears. This compares to just 6.44% in Castlereagh. Across all 26 of the former council areas this totalled £80.1million. The former Derry city council had the highest level of non-domestic properties in arrears, with just under 22% of properties accounting for £5.5million. At the other end of the scale, in the largely rural district of Moyle, £247,295 is owed by less than 10% of non-domestic properties. Across all former 26 council areas, non-domestic arrears totalled £82.7million. To access the datasets related to this story, click here.